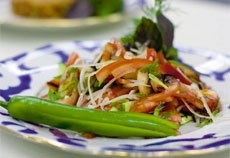 Do you want to try authentic Uzbek food? Not by going to Tashkent, but in a vast Uzbek cavern, complete with bas relief paintings on the walls, stained glass windows and dancers, intricate metal work, and a mid-day touch of ochre on the walls. 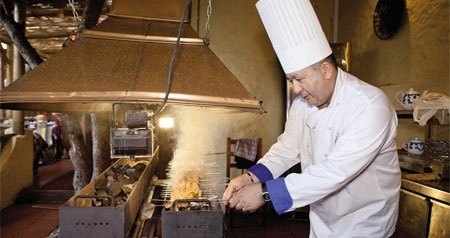 Come to the 250 seater Uzbekistan restaurant at Neglinnaya 29, one of Arkardy Novikov’s first Moscow projects opened in 1999, and quite possibly his grandest. The place used to be a vast Soviet “stolovia”, where you could, if you were lucky enough to get in, sample various staid Russian and European cuisines. Now the place is an Eastern palace. 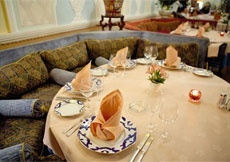 The menu reflects its Uzbek accent, but also presents a good selection of Chinese, Arabian and Azeri dishes, as well as a few of the establishment’s Soviet dishes. As a result, the place has an original new menu and interior, yet feels solid—unlike so many of Moscow’s new “experiments”—with a history going back 60 years. 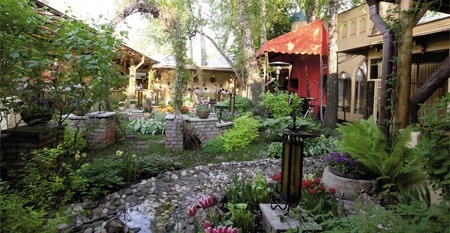 Perhaps to equal the rather film-set-like restaurant next door, “Beloe Solntse v Pustinye,” which opened in 1997. Arkardy really went to town on doing the place up. He spent 2 years on renovation. Chairs were bought in Damascus, carpets and almost everything else bought in from Tashkent. Uzbek architects, sculptors and artists created vast frescoes covering the walls, giving the place an authentic feel, if slightly bizarre. But that is only what you should expect in a building that hosts Abdullah’s partner sharp shooting in an miniature minaret on the roof. It is not just the furniture that has been imported. So are most of the vegetables. The tomatoes and cucmbers, for example, are brought in from Azerbaizhan. You don’t have to sit on the floor, in this Uzbekistan on dastarkhani, but you can sit on cushioned seats, sip tea and smoke a kalyan, if you want. We didn’t, and chose a comfortable, European-style table. 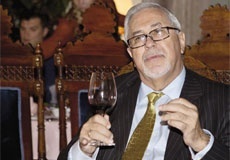 John Ortega chose the “Reiver” wine which had some body to it. We followed this up with a 2007 |Shiraz, Barosa valley. Our meal started with respectfully big Lepeshkas, baked in pancake oil, and roasted on a mangal. This was accompanied by Salad Mangal, made of artichokes, aubergines, olive oil and black pepper, which had the effect of making one hungry. Then the Chebureki were brought in, made with Australian lamb. These weren’t your chebureki from a pseudo-Soviet establishment of the same name, these were the real thing, made with good quality, fresh dough, complete with Salad Tashkent which provided an sharp side kick. The band, from Tashkent, called Inter Azia kicked off with an number with called Julia all about looking into your lover’s eyes. A belly-dancer wiggled her way down the aisle to our table, stayed an inordinate amount of time, was rewarded with a note placed with great difficulty somewhere around her charming waist, and then wiggled off. The group sang in Russian, and I thought I was back in Soviet Azerbaizhan. Whatever, the place is bizarre, and magic. Then came the Lagman, which John said were the best he had ever tasted, and then a special Smetana dish with steamed mante, young lamb with some onion. The Lagman, good as it was, was only a prelude to the shashlik. This was tender, medium cooked, warmed whilst served on a side table. The meat was marinated with a collection of herbs that Alexey Soboloev, the manager said was a special secret, on that gave the meat a slightly spicy, simply delicious flavour. Next, the “Plyov”. As anybody who lives in Russia knows, Plyov comes in many shapes and sizes, from the versions served in stolovia’s with hard, dried pieces of meat, to the succulent taste experience that was one of the evening’s highlights. The Plyov, like all of the dishes, was served up quite unassumingly by a waitress with real character. Dilshod said she was like somebody out of a film, a description that could have been used to describe the whole evening. If you want to try something different, for a reasonable price, go to Uzbekistan.